Samsung Galaxy S5 Active has been in news ever since the S5 went official and today, for the first time, we have a Galaxy S5 Active press render. 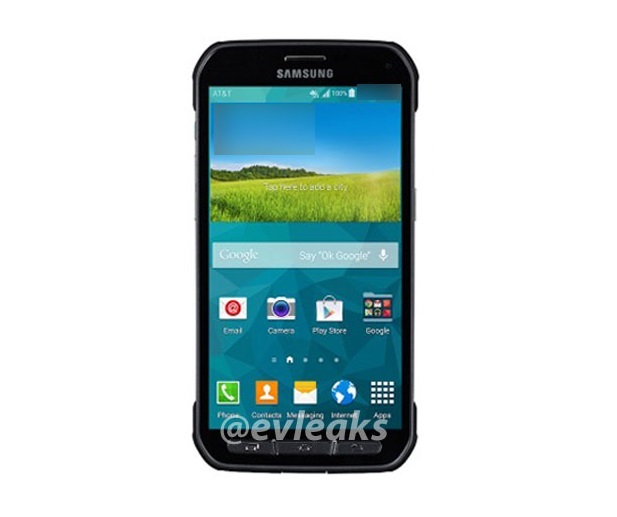 The Samsung Galaxy S5 Active is scheduled to hit AT&T soon and the press render reveals the rugged looks of the device. Since, we all know the Galaxy S5 is already a water and dust resistant device, we did not really expect a S5 Active. The Galaxy S5 Active is reportedly way more rugged and it should handle all types of abuse pretty well. The device looks a lot like the Galaxy S4 Active, with the same hardware keys on the front but the device will supposedly be more rugged. The Galaxy S5 Active is said to be coming with a 5.2-inch 1080p display and all the specs we have come to know from the Galaxy S5. The Snapdragon 801 chipset, 2 GB RAM, 2800 mAh battery, Android 4.4 KitKat, all should be present in the device. The heart rate monitor is present, although the fingerprint scanner and OIS in the camera are missing. We don’t know when Samsung plans to make the S5 Active official but rumors suggest a late June launch and as always, we’ll keep you informed.